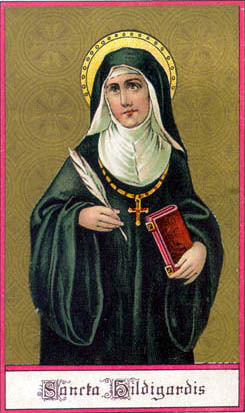 The Christian mystic Hildegard of Bingen experienced visions that started in childhood and continued until her death in 1179 A.D. During medieval times, women didn’t keep journals nor jot down their spiritual or ecclesiastical ideas; however, Hildegard became convinced that she was being instructed by a heavenly voice telling her to record information gained during her ecstatic states of consciousness. Hildegard, worried that she might be ridiculed by others, was reluctant to do as she was told. Eventually, however, she began dictating to her scribe what her inner visions unveiled for her. She also created musical compositions, a morality play, poetry, and works of art that revealed what she called mysteries and secrets of the Divine. Her body of work earned her high regard by the church. O God, by whose grace thy servant Hildegard, enkindled with the Fire of thy love, became a burning and shining light in thy Church: Grant that we also may be aflame with the spirit of love and discipline, and may ever walk before thee as children of light; through Jesus Christ our Lord, who with thee, in the unity of the Holy Spirit, liveth and reigneth, one God, now and for ever.